UPS Mail Innovations is a joint venture that shares shipping service between UPS and US Postal Service, used by many large online retailers such as Amazon, EBay, Groupon, etc. This bulk discount rate option begins with UPS picking up the packages and sending them to a UPS processing facility which then forwards packages to the local USPS mailing depot where the final delivery confirmation will be delivered via the postal carrier. 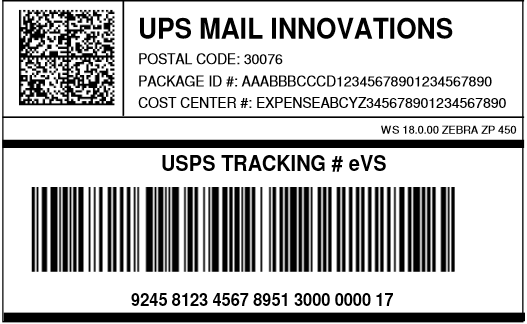 The UPS Mail Innovations label requires two barcodes, the Data Matrix barcode used by UPS and the IMpb tracking barcode used by the USPS. Generated by the IDAutomation Data Matrix Barcode Font and Encoder, the Mail Innovations Data Matrix Barcode includes the following required fields, where each field is to be separated by a tab per the standard outlined in the UPS Mail Innovations Guide to Labeling Supplement. Visit the UPS Mail Innovations website for additional specifications for the Commercial Mail Construct (CO2) for the USPS IMpb Tracking Number barcode.